Multiple Sclerosis is a debilitating nervous system disease that affects over 23,000 Australians, with varying types and symptoms. On The Go Rehabilitation services specialise in providing professional physiotherapy and exercise physiology services which have been shown to help reduce symptoms of MS for many sufferers. Contact us for more information. Multiple sclerosis (MS) is a chronic disease that affects the central nervous system, including the brain, spinal cord and optic nerves. MS is considered by experts to be an autoimmune disease, caused by the nervous system being attacked and damaged by the immune system. MS generally progresses gradually, with alternating periods of remission, good health and disabling flare-ups. Most people with MS, perhaps as many as 85 percent, are diagnosed as having the relapsing remitting type. For these people with RRMS, clinical attacks or periodical relapses can occur months or years apart, before moving into remission once a relapse has resolved. Each individual’s relapse varies in type and severity – and can affect vision or mobility, cause pain, cause new symptoms to appear or worsen symptoms already experienced. Relapse periods can often be hard to judge when occurring, so it is essential you contact your MS nurse or GP if you are experiencing new, increased or altered symptoms to determine if it is a relapse. Also called ‘highly active’ or ‘severe’ RRMS, rapidly evolving RRMS is categorised as having two disabling relapses in one year. Rapidly evolving RRMS will also generally involve MS activity in the brain showing up as lesions in an MRI scan. People who are initially diagnosed with relapsing remitting MS (RRMS) may then transition to secondary progressive MS (SPMS) in the future – which is characterised by fewer or no relapses, and a gradual worsening of symptoms. Some people diagnosed with SPMS may still experience relapses, but remissions following a relapse are generally less complete, or the time between relapses is shortened. SPMS is diagnosed by a neurologist after careful observation of MS symptoms over time, with only a small number of people diagnosed with SPMS from the outset. In these cases, looking back it becomes apparent that the person has generally been experiencing MS relapses for a number of years prior to seeing a neurologist. Around half of people with RRMS, will develop SPMS about ten to fifteen years after initial diagnosis. SPMS varies between individuals, with some people experiencing a gradual worsening of symptoms, and others becoming more disabled more quickly. Benign MS is a form of RRMS, used to describe a person’s experience of RRMS after many years – it cannot be diagnosed with from the outset. A person will be initially diagnosed with RRMS for a period of around 10 to 15 years before a neurologist may suggest that their MS is benign. People diagnosed retrospectively with benign MS will have exhibited mild symptoms with infrequent relapses, and complete recovery following relapses. People with benign MS will have little or no disability ten years after being initially diagnosed as RRMS. A person whose MS is classified as benign can still experience relapses and symptoms, and their MS may change as they grow older. Around 10 to 15 percent of people with RRMS will be diagnosed retrospectively with benign MS.
Around ten percent of people are diagnosed with MS are diagnosed with the primary progressive MS (PPMS) type. PPMS begins with a slow progression of neurological symptoms. PPMS effects individuals differently, with some people experiencing a steady worsening of symptoms, and other people finding they become disabled more quickly. It can take many months or even years for a neurologist to arrive at a definitive diagnosis of PPMS as changes can be subtle and hard to identify over an extended time. MRI scans can prove inconclusive. Most people with PPMS will not exhibit relapses, but a few do. If relapses are part of PPMS, this is called progressive relapsing MS.
Clinically Isolated Syndrome (CIS) is used to describe the first neurologic episode that lasts at least 24 hours, and is caused by inflammation or demyelination in one or more sites in the central nervous system. CIS is often diagnosed before a formal diagnosis of MS can be made. Around 80 percent of people with CIS will go onto develop MS within one to five years. A diagnosis for Multiple Sclerosis is based of an assessment of your symptoms by your doctor – when they started and how they’ve progressed or eased over time – as well as physical examination and testing process. Medical conditions that can mimic MS include metabolic or vitamin deficiencies, unusual infections, degenerative disorders of the nervous system, inflammation of blood vessels in the brain or cancers that have spread to the brain. For this reason, blood tests, X-rays, brain and spine MRIs and spinal taps to analyse cerebrospinal fluid may be required prior to diagnosing of MS with certainty. The symptoms of multiple sclerosis depend on which particular pathway of nerve fibre is effected by the disease. Damage to myelin in the spinal cord can result in tingling, numbness, tightness or weakness sensations. Similarly, nerve fibre damage to the bladder may result in urinary incontinence, and damage to the cerebellum portion of the brain may result in a lack of coordination or imbalance. 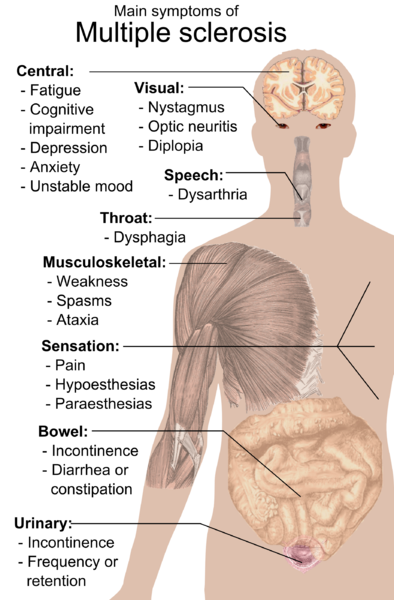 MS patients can have a very wide range of symptoms, depending on where the damage occurs in the central nervous system. This often makes diagnosing the disease a struggle for doctors. However, the most common symptoms of MS include changes in sensation or sensory symptoms such as tingling and numbness, and changes in muscle function or motor symptoms such as difficulty walking, stiffness or tremors. Though MS is not directly inherited, there does appear to be a genetic component which makes people more susceptible – possibly a combination of certain genes. Therefore, family members of someone diagnosed with MS have a slightly higher chance of developing MS themselves. Interestingly, studies have found that people living further north of the equator have a higher chance of developing MS. For example, there appears to be a high rate of MS in the UK (MS is more common in Scotland than in the rest of the UK), North America and Scandinavia, but much lower rates in countries like Malaysia which are very close to the equator. Some research in to this data suggests that there is a link between MS and vitamin D deficiency… as Vitamin D mostly comes from exposure to sunlight, which is at a higher rate closer to the equator. Research on this matter is on-going. Although the cure for multiple sclerosis is yet to be discovered, there are several medications which have been proven to help with the symptoms and slow the progression of the disease. There are medications available that can be used to manage chronic symptoms (those that last longer than three months) and acute symptoms (those that last less than three months). It’s best to consult your neurologist or doctor about what medical treatments and self-management strategies might be most suitable for you. Disease modifying therapies, sometimes known as immunotherapies, are used to treat relapsing-remitting multiple sclerosis. These medications work to reduce disease activity, so the myelin around the nerves is subjected to less damage. Immune suppression therapies such as methotrexate or mitozantrone are sometimes used to inhibit the activity of the immune system and manage symptoms, generally used by people with very active multiple sclerosis. Steroid medications such as Methylprednisolone can be used to ease inflammation in the affected areas, and thus minimise the severity of a multiple sclerosis relapse. A large number of new therapies to treat multiple sclerosis are being trialled. Contact your neurologist for more information about new treatment options and whether you might be eligible to participate in trials. Problems with mobility, balance, fatigue and spasticity are common issues for people diagnosed with MS for which physiotherapy can be a beneficial therapy. Physiotherapists provide a unique contribution to the management of people with MS by improving and maintaining functional abilities and managing the physical long term symptoms. Physiotherapists can provide specific rehabilitation programs and facilitate self management and coordinated care. For people with more complex needs physiotherapy should be delivered within a multidisciplinary specialist team/service where regular evaluation and assessment can be provided. There is evidence that multidisciplinary rehabilitation can improve levels of activity and participation levels of people with MS. The greatest potential for central nervous system adaptation and recovery occurs in the early stages of the disease. Physiotherapy intervention and advice early after diagnosis can reduce disability, maximise potential for independence, improve employment sustainability and reduce the impact that the disease has on health and quality of life factors. There is a strong body of evidence demonstrating that exercise used as part of a rehabilitation programme can increase activity and improve the health and well-being of people with MS. In addition there is an emerging body of evidence to say that physiotherapists, as part of a specialist neurorehabilitative service, have a key role in managing specific symptoms of MS including pain, spasticity and the prevention of secondary complications such as contracture. Results from randomised controlled clinical trials of exercise programmes in MS have demonstrated benefits in muscle strength, cardiovascular fitness, aerobic thresholds and activity levels and functional improvements, such as walking ability. Exercise is generally highly valued by patients who report improvements in mood and quality of life. For further information or enquiries regarding MS treatment, contact the professionals in rehabilitation services at On The Go Rehab today.